This episode opens with Abby trying to teach Crane yoga. Abby encourages Crane to do this for Katrina because everyone woman likes her man to stay in great shape. This however is not enough enticement for Crane, who quickly drops the pose, when Abby brings up the benefits to his "double jug". Abby tries again calling it training for their war against Moloch because Crane has been anxious since he last saw Katrina. It seems however that Crane is back to justifying Katrina's lies to himself. Abby encourages Crane to just admit that he feels pissed off and finally Crane admits that it's hard in good conscious to keep having faith in Katrina. Abby questions what will make Crane feel better and he gets a big smile on his face. The two head to the bar to get their drink on. They witness a fight and Abby, being a cop, has to break it up. One of the fighters is Joe Corbin, that's right, Jack Corbin's son. Abby follows Joe outside after he is tossed out by the bartender, where she welcomes him home. Joe questions what happened to Quantico because Abby is still here. Abby jokes about being here to keep Joe in line and then brings up his honourable discharge and what happened with Joe's platoon. Joe is quick to turn and tell Abby that what happened to his platoon and what happened to him are none of her business. Joe calls Abby a charity case that Jack took pity on and adds that it got his father killed. Abby tries to say that there is a lot about that night that Joe doesn't know, so Joe asks for an explanation. Abby flashes back to the night that Jack died and when she cannot find the words to talk to Joe, he simply tells Abby to stay away from him. Another demon is the woods watching drug dealing going on. Abby and Crane drive back and Abby explains about how she used to babysit Joe and that their relationship used to be good. Crane advises that Joe will find his way because "once a hero, always a hero." Over the radio, Abby hears a call regarding Corbin and decides to take the call. Crane finds the breathalyzer and blows into, exclaiming that he has won, when all the lights flash. Abby pulls up to the area where drugs were being dealt earlier and when Crane hops out of the car, he finds a demon footprint. They rush around and find the men who were gathered there dead. Joe is leaning against a tree and he is mumbling that his father knew and that "it" is going to kill them all. The next day, Abby goes to see Joe in the hospital and brings up his mention of Jack the night before and the fact that he was the sole survivor of his platoon. Joe snarks that Jack never told him anything because Jack was too busy with Abby. It seems that Joe still carries a lot of resentment about what happened and so Joe simply tells Abby that if he remembers anything from the night before, he will let her know. Still in the mental institution, Frank confronts Henry about stealing his soul. Henry makes it clear that when Henry dies, that he will own him but adds that if Frank takes a life, he can regain his soul. Frank is duly appalled about the idea of taking an innocent human life. Henry says that it doesn't have to be innocent and brings up an old client of his who drove drunk and killed a little girl. That's right, Henry wants Frank to kill the man who paralyzed his daughter. Henry adds, "that when one gazes long enough into the abyss, the abyss gazes back," before leaving. Abby and Crane get together and Crane admits that he has been researching modern wood monsters but none of them match the creature they encountered. Abby snarks that the only thing Joe remembers is his resentment towards her. Crane suggests that Joe may not be a mere victim, given his weird behaviour. Abby questions what Crane means and so Crane brings up the fact that Joe admitted that his father knew about monsters. Abby comments that Joe was simply calling out for his father but Crane counters saying that dying soldiers call out for their mothers and not their fathers. Crane adds that it is odder still to walk away without a scratch. Abby then brings up the report of what happened to Joe's platoon in Afghanistan and they learn that one of the soldiers bodies had no internal organs, just like one of the bodies from last night. Crane questions what monsters consume internal organs. Crane then brings up Daniel Boone and of course Ichabod and Abby have a moment to bicker. It seems that Boone wore the raccoon hat, to cover the scars he received after his brother with PTSD attacked him. The brothers ended up living with the Shawnee for a year, looking to cure for an affliction. Crane then brings up the wendigo. 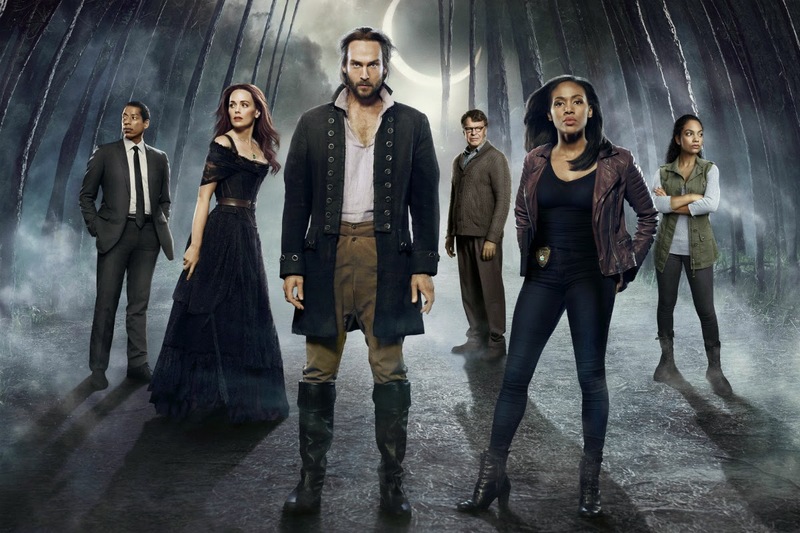 Well, I suppose it took awhile for Sleepy Hollow to have its wendigo episode. As they read, we get flashes of Joe having an incident when someone cuts their hand. Abby decides to go and see Joe but before she can out of the door, she gets a call saying that Joe is no longer at the hospital. They decide to check Joe's apartment and find it empty as well. Crane accidentally steps on the remote control, turning on the video game Joe was playing. This of course gets a monologue from Crane about the ineffectiveness of modern modes of relaxation. They end up finding Jack's last will and testament, where Jack asks Joe to protect a few rare items. It leads Crane and Abby to Pioneer Point, where they surmise that Jack wasn't searching for prey but for something his father left behind. Joe is digging and stops when he comes across something. Abby and Crane show up just as Joe gets the mystery item out of ground promising to help him. Joe takes off running and Abby and Crane make chase. When Crane accidentally cuts his hand on a chain link fence, this causes the change to come across Joe, who yells that Crane is to run. Joe turns into some kind of beast and Abby rushes back to the car to get a weapon. Abby finally shoots the beast and it falls across Crane. Beast Joe is now back in the Masonic batcave and under observation by Abby and Hawley. Abby brings up a cure but Hawley says that most of his ideas for a cure, involved killing the wendigo. Hawley does however assure Abby that they are going to figure it all out. Their conversation is interrupted by Jenny, who has a cooler containing body parts. From the look on Jenny's face, she is not pleased to see Hawley staring so intently at her sister. Please, oh please Sleepy Hollow, don't have two Black sisters fighting over the blonde White guy. Jenny takes the case into Joe's cell and he is only restrained from attacking her by his chains. Jenny tosses Joe what looks to be liver pieces and after wendigo Joe consumes them, he turns back to human. Hawley hands Abby a bag, saying that he is going to go and do so some reasearch. A now human Joe asks Abby what is going on and she explains that he turned into a wendigo. Abby offers to help Joe and Joe explains that he didn't realise until after Pioneer Point that blood triggered his change. Joe explains that while in Afghanistan, he got a letter filled with weird white powder, which Ichabod calls human bone dust mixed with Black magic. The letter explained that Joe had been cursed and that the only way to stop the curse, was to trade it for an item Jack left behind for Joe. At first, Joe believed that it was false, until he went out with his platoon and changed for the first time. Joe then reveals that there was no return address on the letter, just some place called Frederick's Manor. This causes both Abby and Ichabod to realise that Henry Parish sent the curse. Ichabod suggests that whatever is in the box, is part of Henry's greater plan. When they open the box, they find a deadly bottle of toxin from southern China. Later, Ichabod apologises for Henry and admits that Parish is his son. Ichabod tells Joe that they cannot trust Henry with the cure but does however admit that he loves Parish. Joe advises Ichabod to tell Henry this no matter what happens to him. Abby has done some research and learned that a human can only turn into a wendigo four times before the change is permanent and she shares with Ichabod, that Joe has already changed three times. Abby questions if Ichabod has tried to get in touch with Katrina but he says that he cannot do so without Katrina's familiar and he is unsure if Katrina had any relationships with the Shawnee. Hawley volunteers that he has traded with a few Shawnee men but adds that the men are not easy to get along with. Ichabod pipes up to add that the Shawnee respect quality of character above all else and this is perhaps the reason why Hawley has had trouble in the past. Abby sends Hawley and Ichabod off together to meet with Hawley's contacts. They arrive at a garage where Big Ash immediately accuses Hawley of selling a tribal mask which he sold to Hawley, on the agreement that the mask would remain in Hawley's possession. Big Ash moves forward in a threatening manner and Ichabod intervenes to promise that Hawley will find the mask he traded and return it, if Big Ash helps them find a wendigo cure. Of course, Big Ash does not believe that wendigo's exist. Ichabod tells Hawley that they should leave because if the Shawnee could not help Boone, they cannot help them. This gets Ash's attention and he calls over the shaman Frank. At the masonic bat cave, Abby goes to see Joe and they talk about old times for awhile. We get a flashback to Jack and Abby in the police station, where Abby is ordered to do some filing. Jack talks glowingly about his son and in the present, Abby tells Joe that she wanted to be a part of what Jack and Joe had. Joe explains that he always felt like something was wrong with him because he wasn't enough for his father, but Abby explains that Jack just had a big heart and could not stop helping people. Abby assures Jack that Joe was proud of him and that is why Joe was passed the torch. Joe admits that he loved his father. Parish bursts in with a group of armed men, explaining that while the hexes may prevent him from doing magic, they don't fix the old locks. Parish asks for the poison and Abby replies that she has never heard of it. Parish says that Joe is his servant and that he knows that Joe has found it. Jenny sneaks up behind one of Parish's armed men with a gun and orders him to drop it. The men continue to hold their position and Henry again asks for the poison, to avoid a total bloodbath. Joe steps forward asking if he hands over the jenkin, if Henry will leave Abby and Jenny alone. Parish agrees to this and Joe leaves to get the jenkin. Joe retrieves the jenkin and Parish tells Joe to come with him to get his cure. Joe looks back at Abby but Parish says that Abby will only keep Joe locked up and will never get his cure. Parish argues that Abby cannot protect Joe anymore than she could protect Jack. Joe moves to leave with Parish and Abby calls out for him to stay but Joe follows Parish out and the men lock Jenny and Abby inside. Outside, Parish asks for Joe's hand and thinking he is going to get cured, Joe hands over his arm, only to have Parish cut him. Parish says that Joe's true curse is humanity and now Abby will see him for what he really is - a creature of war. Parish gets into the car and is driven away, while the change begins to come over Joe. Inside the asylum, Frank approaches Gil Everett, the man who paralyzed his daughter. Frank tells Gil that he ruined his life, his marriage and that his daughter will not only never walk again, but never have kids. Frank admits to fantasizing in the past about killing Gil and says that he only wants to make it right. Frank offers Gil his hand and Gil takes it, half heartedly saying sorry for hurting Marcy. The problem is that Frank's daughter's name is Macy. Frank starts squeezing Gil's hand, as Gil complains about Frank ruining his life as well. Gil complains about being forced to stay in a hell hole because a cop's kid was too stupid to get out of the way. Frank takes Gil to the ground but stops when he has a flash of himself in battle at the apocalypse. Realising that this is what Henry wants, Frank lets go of Gil. Hawley and Crane return and free Jenny and Abby. Crane holds a human skull, saying that they must chant the spell written on it, over the blood of the cursed, procured by an obsidian knife. Hawley points out that the Joe probably has already turned, so Crane suggests working the cure before Joe has a chance to kill someone. Holding up the knife, Crane explains that if they are too late, stabbing the knife into Joe's chest will end it all. They march out of the batcave and Abby and Crane both slice their hands. Crane asserts that since Parish did this, he must make it right. Abby and Crane run through the night calling for Joe with bloodied hands until they finally come across wendigo/Joe. Abby and Crane take off running, while in another area, Jenny questions how long Hawley is going to be in town for. Hawley doesn't give a straight answer and simply says that he follows the money. Abby and Crane run by Hawley and Jenny screaming for them to get ready. Abby continues to act as bait, as Crane gets the blood sample and then says the incantation. Unfortunately, at the end of the incantation, Joe does not change back to human. Abby insists that Joe just needs a little more time and the spell kicks in and a naked but human Joe, collapses on the ground. Abby takes Joe back to the office she and Ichabod work out of to find that Crane has embraced video games. Joe asks Abby to write a letter of recommendation for him to Quantico and Abby agrees to do so. Abby then gets a call from Frank, who says that she hasn't called for a long time and that Henry has his soul. Abby promises to to fix what ever Parish has done but Frank calls the matter settled. Frank begs Abby not to let him down before hanging up. Abby tells Ichabod what is going on and adds that Parish must be stopped. Ichabod agrees that Henry has done unspeakable things, and in his own space, Parish begins to work with the stolen poison. Ichabod points out that Katrina has not given up on Parish and brings up Abby not giving up on Joe Corbin, before saying that he must fight for his son. The poison has turned into an insect and sits in Frank's hand. Later, we see the same insect crawling inside Katrina's mouth. Okay, the moment I heard the word wendigo, I knew that this was going to be some sort of monster of the week episode. The meta plot did not move at all this week and instead we were treated to monsters and angst. Joe's relationship with Jack is meant to be juxtaposed to Crane's relationship with Parish. The difference of course is that Jack knew Joe from birth and raised him, whereas; Ichabod only learned about Parish long after he had become the horseman of death. Ichabod couldn't actually really love Parish; he loves the idea of a son and the two are not nearly the same thing. The problem with all of this is that I don't give a damn about it in the slightest. I am further in disappointed that Ichabod is back to trying to justify Katrina's actions instead of facing them head on. Between Parish and Katrina I would say that Ichabod has a major case of denial regarding how dysfunctional his loved ones are. It is telling that Frank had to be the one to call Abby. Clearly she hasn't learned a lesson about allowing people to stay locked up in a mental institution and contacting them. Now that Frank is out of site, he is literally how of mind for Abby. She and Ichabod are after all "the witnesses" and therefore have more important things to concern themselves with. Finally, thought, if they have the Mills sisters fighting over Hawley, I will spit my dummy out. We really don't need to see two Black women fighting over a white mmkay.